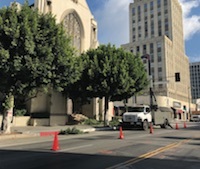 The landscape crew for the District's Wilshire streetscape continues to maintain all 15 medians and about 150 flower pots along Wilshire Blvd. The work consists of removal of trash, trimming of plants, watering of plants, repairing the sprinkler system, and replacing damaged plants. Last quarter the WCBID trimmed 3 large ficus trees. Last quarter, the sidewalk maintenance team collected 2,952 bags of trash (67,892 lbs. ), dispensed approximately 4,000 doggie bags, removed 32 bulky items, and removed 5 graffiti tags on sidewalk pots, poles and news racks. 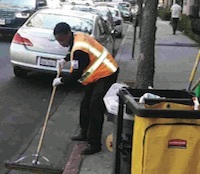 The crew is out every Monday and Thursday sweeping the sidewalks, picking up trash, clearing gutters and painting out graffiti from street poles, news racks, and flower planters. The team empties over 60 trashcans throughout the District.rict. The clean team has been working very closely with the bike team to identify high needs areas. Last quarter, the security team assisted the City in getting over 389 bulky items picked up, made 105 calls/reports to the City for street services (311), assisted in getting 353 graffiti tags cleaned up, and 8 potholes reported and fixed. The team responded to 204 calls for assists to property owners, managers, stakeholders, pedestrians, LAPD and others. They assisted 326 homeless individuals; reported 267 homeless encampments; 390 illegal signs were removed. The team addressed the subject of 166 belligerent transients and 29 drinking in public. The team captain attended 5 LAPD crime control meetings and attended the quarterly Business Watch meeting. The WCBIC continues its efforts to work with the HOPE Team, LAHSA, DMH, CD10, CES and others to continue addressing homelessness in the District. The "Good" in Good Burger means much more than taste. At Monty's Good Burger (516 S Western Ave.) they strive to sensibly source their ingredients, use only compostable serving products and provide their staff a living wage. 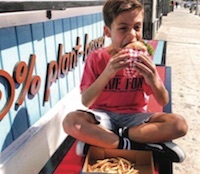 Monty's Good Burger serves up refreshing organic fountain sodas made with pure cane sugar, sparkling house-made lemonade, handcrafte sauces and delicious organic shakes blended with soy. Burgers feature buns by Bosch Bakery and plant-based cheese and Vegenaise® from Follow Your Heart®, a locally owned, family business. Monty's Good Burger was made possible by Creative Director Dennis Gomez, Art Directors Max Angles & Lexie Jiaras, their staff and of course, Monty. Angelenos in Wilshire Center are traveling to work, to school, to visit friends, dinning and shopping by way of the METRO, local Smart Shuttle system, DASH, and by foot. Surrounding the transit stops are high-activity, livable, pedestrian oriented neighborhoods that are linked to other neighborhoods via rail, bus and other modes of transportation. This pedestrian-oriented neighborhood is identified by compact development that provides for a full range of economic and social services, including housing, ground floor retail, community and entertainment facilities, grocery stores and cafes. Wilshire Center is vital, active and moreover, this area contains a safe and clean environment with attractive settings for living and working. By integrating life around METRO transit, Wilshire Center and the City of Los Angeles have the opportunity to reduce automobile congestion and consequently to better the City's air quality, provide a more efficient land use pattern and create a better quality of life for all Los Angeles residents. Besides the net reduction of internally generated traffic, a good jobs/housing balance strengthens the sense of community and neighborhood and provides for a better overall environment both socially and economically. IMPLEMENTATION: In 1995 the City of LA Planning Department, in cooperation with the Wilshire Center Urban Design Taskforce of the Wilshire Center/Koreatown Citizen Advisory Committee of the Community Redevelopment Agency (CRA LA) along with many other community individuals and groups, initiatedacooperativeplanningeffort to update the Wilshire Community Plan. 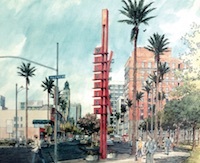 This Community Plan Update (CPU) was designed to encourage wise growth, provide appropriate locations for development, minimize lengthy, discretionary approvals, and provide a certainty and predictability for developers, homeowners, and anyone else concerned with future development of Wilshire Center and the surrounding area. BACKGROUND: Wilshire Center is a long established commercial and residential district in the core of Los Angeles. It is an exciting and vital area where people work and/or live adjacent to transportation links to all of L.A.'s business, residential, and cultural areas. Wilshire Center is a Regional Center for various interrelated commercial office, shopping, residential, and cultural activities. It is generally bounded by 3rd Street on the north, Hoover Street on the east, 8th Street on the south, and Wilton Place on the west (L.A. Wilshire District Plan, est. 1976). REVITALIZATION: In the 1990's the revitalization program began. The first program was the construction of the Metro Red line which opened in 1996, allowing people a quick ride to Downtown, Hollywood and Universal City. Central Plaza along with the Radisson Hotel (today The LINE Hotel) and Southwestern Law School spent millions of dollars on refurbishing their buildings. In 1993 the planning began for the $6 million Streetscape Project with the planting of more than 2000 trees, and with new sidewalks, medians, crosswalks and signage which was completed in 1998. The Wilshire Center Business Improvement Corporation was formed in 1995 and in the same year City Council established the Wilshire Center Business Improvement District (WCBID). The WCBID funded a new private security patrol for the area, a clean team, and a landscaping team. PROFILE: The Wilshire Center District encompasses a three-mile radius from Normandie and Wilshire. The total employment is over 500,000 with about 750,000 residents. It has Los Angeles' most ethnically and economically diverse population. For more on the Wilshire Center BID visit facebook.com/wilshirecenter.